One-piece strapless swimsuit with an asymmetric mustard bandeau. Matte and shiny mustard fabrics. 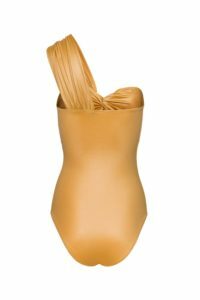 This women’s mustard swimsuit combines matte and shiny mustard fabrics thus turning it into a very elegant garment. The strapless neckline is draped at its center in which the bandeau is attached. Leaving a front slit. It is a unique swimsuit, designed and handmaded exclusively in our spanish and portuguese workshops.